Insul-Deck is a fast, flexible and safe method to build a concrete floor or roof that saves labour, time and money. We have recently added Insul-Deck to our product line. It is one of the fastest systems available to form a concrete floor or roof. Insul-Deck comes pre-cut and staged for quick and easy placement on shoring. Post-tensioned floors and roofs with Insul-Deck's standard forms allow spans up to 40 feet with less depth. INSUL-DECK Roofs and Floors can be built to withstand tornado-level winds, the impact of flying debris, and fires. Elevated buildings are easily constructed with INSUL-DECK raised slabs to minimize or eliminate flood damage. Resilient buildings keep occupants and property safe. INSUL-DECK Minimizes air infiltration leading to fewer allergens, improved indoor air quality, and no drafts or cold spots. High Sound Transmission Class (STC) ratings reduce the noise. A cozy, healthy, and peaceful indoor environment is made easy with INSUL-DECK, which also is perfect for in-floor radiant heating. 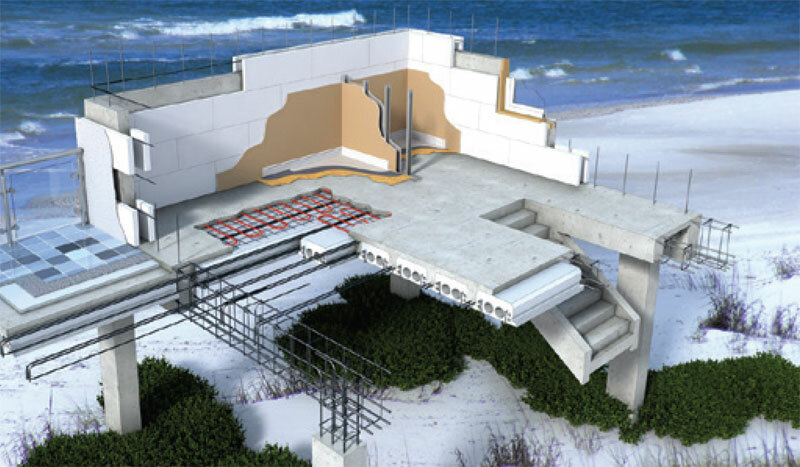 Reinforced Concrete is strong enough for bunkers and all your resiliency requirements. Due to the insulating, thermal mass, and low air-infiltration properties, INSUL-DECK structures easily meet many energy-efficiency program requirements and are ideal for Net Zero and Green Roofs. Inert materials keep occupants healthy for the life of the building.